Tadi Brothers’ 7" Mirror with 120° RV Backup Camera is designed to help you drive your RV with ease. Backing up and parking can be challenging in a vehicle of this size, but it’s no problem at all when you have your 120° backup camera, as it gives you a comprehensive view on all sides. This 100% weatherproof RV box camera system is easy to install and adjusts itself to find the optimal vantage point. Enjoy high-resolution, military-grade night vision and a crystal clear picture. Simply clamp this 7" Mirror with 120° RV Backup Camera monitor onto your rearview mirror and clearly see everything surrounding the exterior of your vehicle. Plus, this sleek, lightweight model can pull double duty as a DVD player, video game screen or even a mirror. It easily connects to virtually any power source, such as a cigarette lighter and won’t take up much space. The Tadi Brothers 7" Mirror with 120° RV Backup Camera is a device you can rely on to help you stay safe on the road. We’re so sure you’ll be satisfied, that we offer a 30 day, 100% money back guarantee. 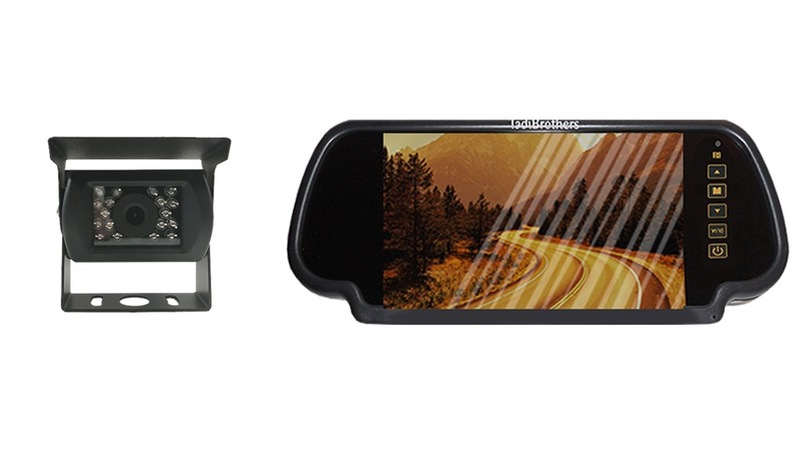 The 7” Mirror monitor comes with an RV box camera that easily adjusts to find the perfect angle for your vehicle. We have made this camera extremely durable so it is able to withstand sand, rain, rocks, and high winds. If an all-weather camera is what you need, look no further. With 380 lines of TV resolution, the rendered picture is always crystal clear. You can even safely reverse and park even in the darkest hours of the night with automatic, military-grade night vision. Tadi Brothers’ primary focus is to provide you with products that allow you to safely drive and park your vehicle no matter what the size. We are so sure you will love our products that we offer a 30 day, 100% money back guarantee. Increase your driving awareness today with the 7” Mirror with 120° RV Backup Camera from Tadi Brothers. "I want to thank you for your amazing service! You are a company that could be a model for others to follow in customer service, support and satisfaction. You are just unbelievably good! Greg Ray"